Embracing Uncertainty With Enthusiasm | Choose Your Energy: Change Your Life! In life, bridges connect us to the future. They provide passage to new discoveries, relationships and opportunities. But crossing a bridge means making a change and change is sometimes uncomfortable. We’re torn between staying where we are and moving forward into the unknown. And often, when given the option to turn back to what is familiar—no matter how uncomfortable or restricting—our desire for predictability and the illusion of control causes us to choose the known rather than the perceived inherent risk of an uncertain and unknown future. 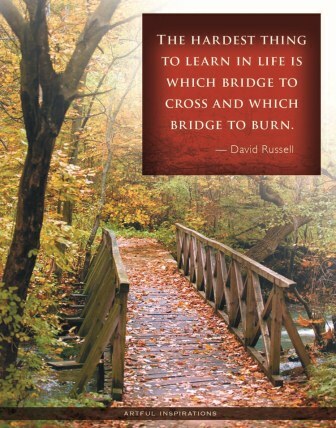 What bridges are you ready to cross—ones that will allow you to turn unexplored possibilities into fulfilling realities? The journey of 1,000 miles begins with a single step. Taking a baby step in a new direction today will make all the difference! Choose your energy and change your life and the lives of every being and situation you encounter. You’re worth the effort! This entry was posted in All My Blog Posts, Curiosity, Respect & Compassion, Force, Flow & Baby Steps, Gratitude, Prosperity & Abundance and tagged Deborah Jane Wells, What are baby steps, What is abundance, What is compassion, What is curiosity, What is gratitude, What is prosperity, What is respect. Bookmark the permalink.